where you should find all the relevant Results, Articles, Interviews and Video Diaries from this years event. 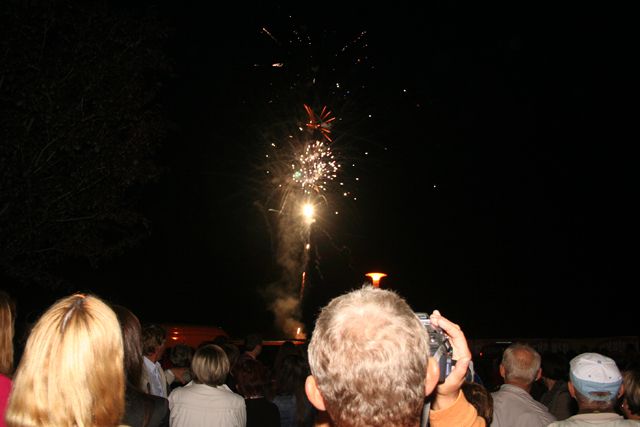 We shall have a selection of galleries showing over a 100 pictures from this years event. We have many varied shots and lots of action from hard fighting barbel, so keep logging in as these galleries will take some time to produce over the next couple of weeks. All these shots where taken by myself and Steve Martin, without whom all the shots from sections A and B would not be here to view on this website. With Section A and B covering 1.6 kilometres and Section C, D and D and E covering 2.2 kilometres, which required some considerable effort on our part. Our photo coverage is must probably rank as the best in the world. Something we have always strived to achieve. We both hope you all enjoy our efforts... we did. We start our Galleries with some shots taken during Thursday and Friday practice days. 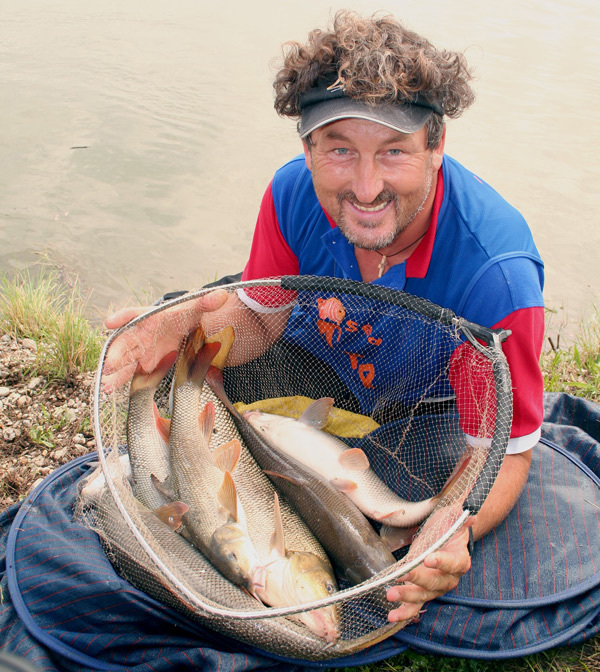 They feature several England anglers along with a 'growling' Frenchman a couple of Russians and some sticky mag sequences. Des Shipp lifts into a large fish in the rain during Thursday's practice session. Des Shipp lifts into a large fish in the rain during Thursday's practice session. Sean Ashby proving that he's not just a small fish expert...he can handle the 'lumps' as well. This one came in during Thursday practice session. 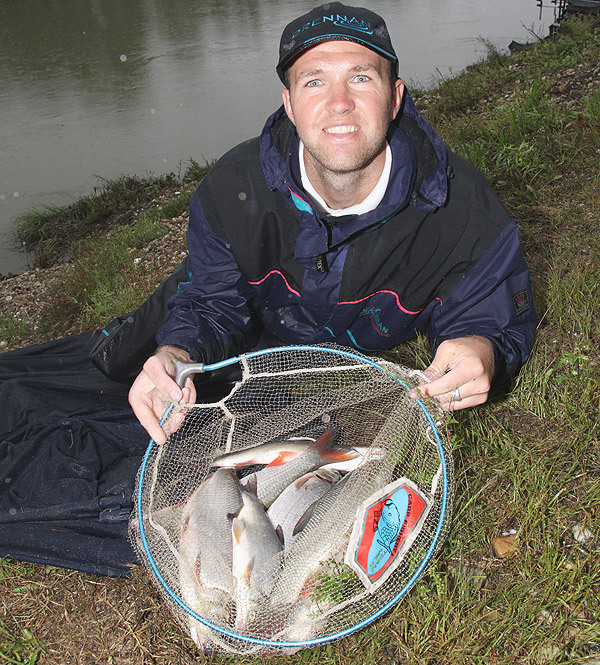 Sean Ashby proving that he's not just a small fish expert...he can handle the 'lumps' as well. This one came in during Thursday practice session. 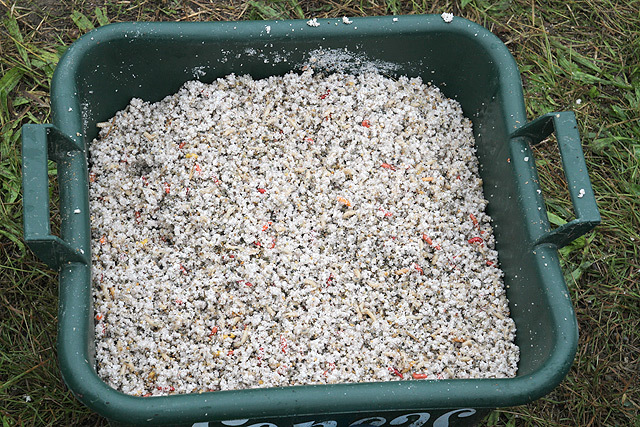 Groundbait was a mixture of soil, groundbait and gravel... the heavier it was the better! 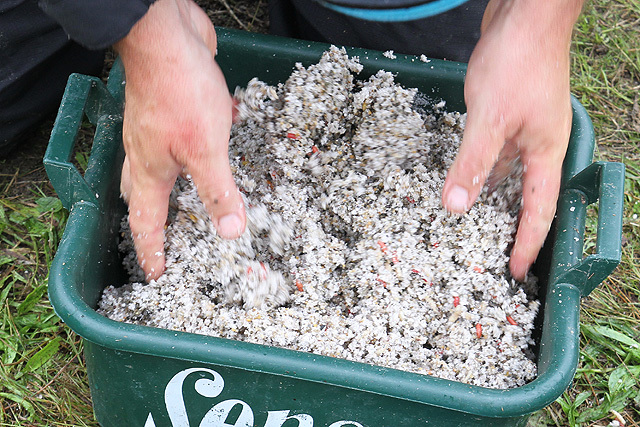 Groundbait was a mixture of soil, groundbait and gravel... the heavier it was the better! 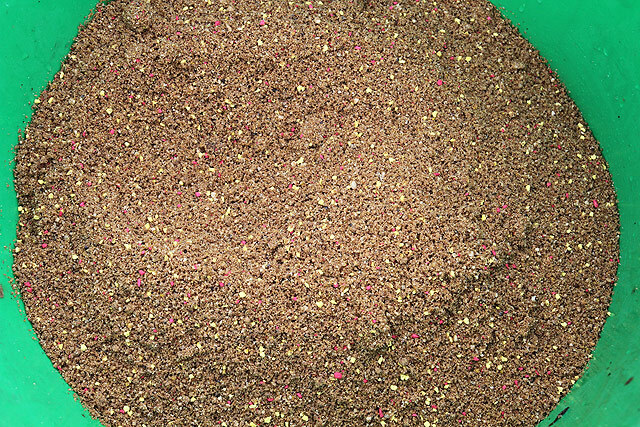 then again thoroughly mixing it all together so that all the gravel and maggots have been coated well. After a period of time the mixture should then be all stuck together, ready to pull off required lumps for feeding. 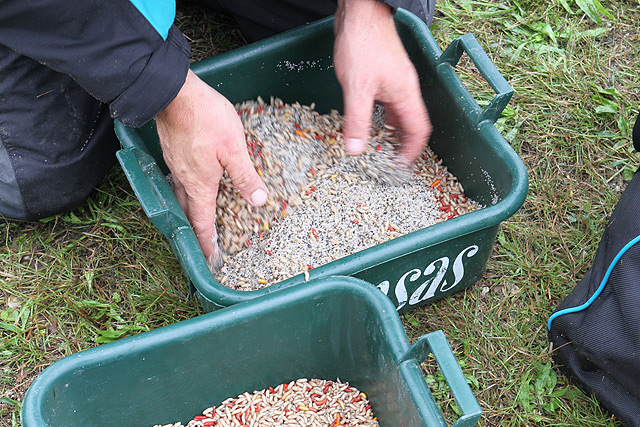 then again thoroughly mixing it all together so that all the gravel and maggots have been coated well. After a period of time the mixture should then be all stuck together, ready to pull off required lumps for feeding. which he pulled steadily on. 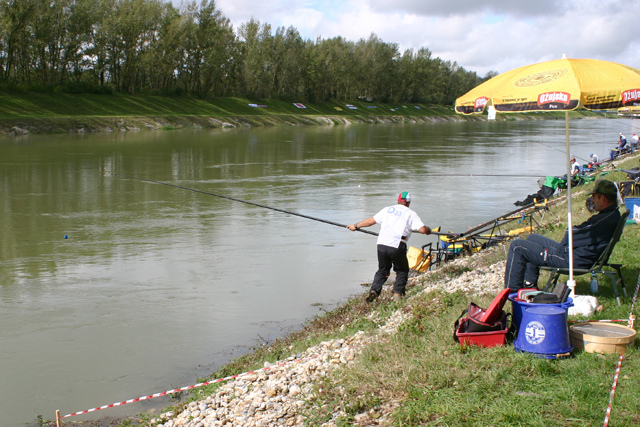 Unfortunately, as happened many times along the venue, the fish came off, whether by 'zebra's' or foul-hooking! which he pulled steadily on. Unfortunately, as happened many times along the venue, the fish came off, whether by 'zebra's' or foul-hooking! England's young debutant was one of the plus points in an England performance which fell well short of expectations and a podium place. England's young debutant was one of the plus points in an England performance which fell well short of expectations and a podium place. 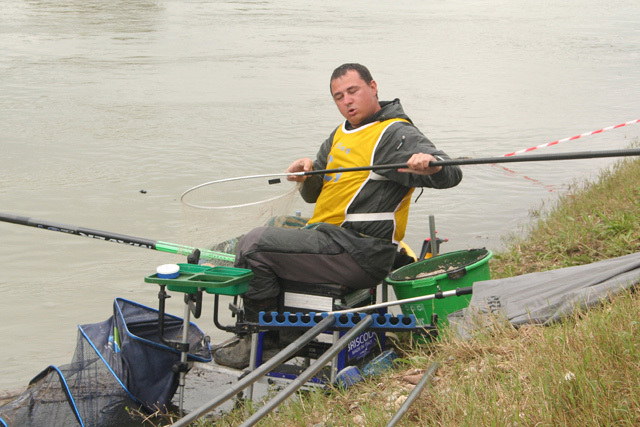 Diego da Silva is no stranger to lollipop fishing. 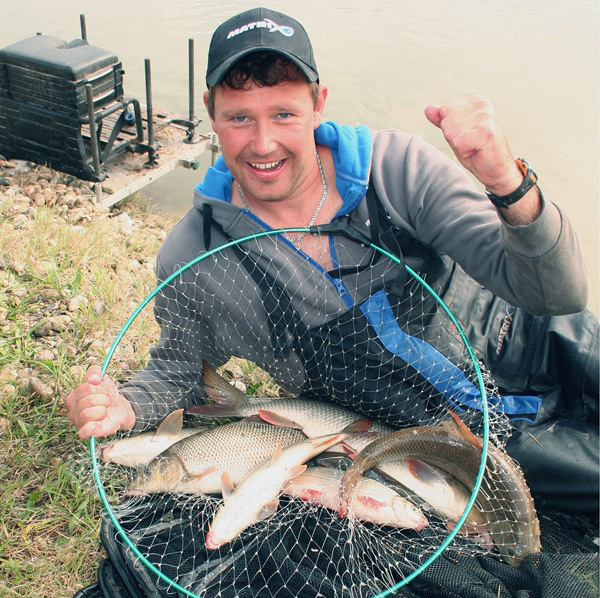 He managed to haul this barbel and other nase and vimba out on the final practice day. Diego da Silva is no stranger to lollipop fishing. 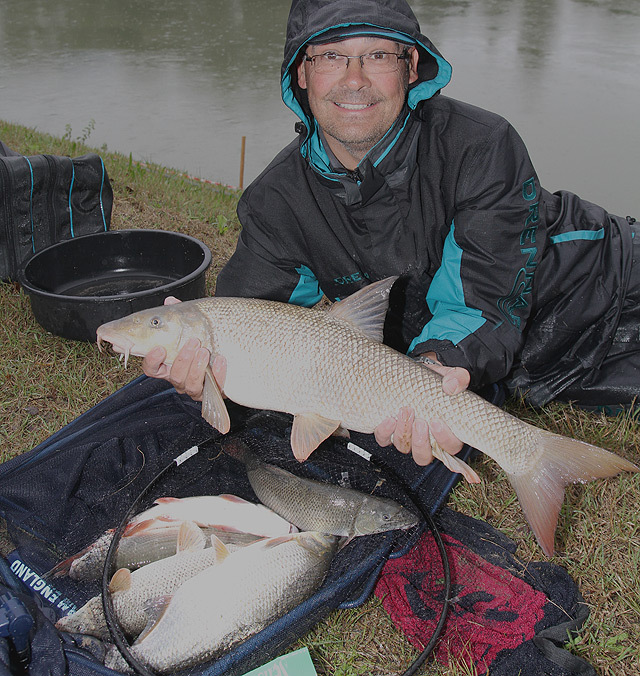 He managed to haul this barbel and other nase and vimba out on the final practice day. Sergey Komarov looks to be a rising star in the Russian team. 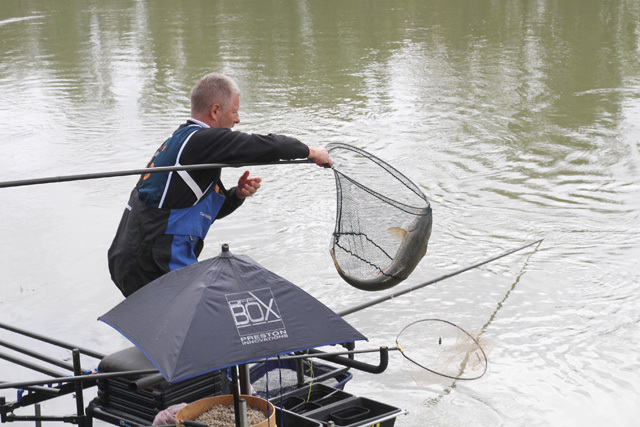 This catch was made from the box nearest the only bridge splitting the five section areas. Sergey Komarov looks to be a rising star in the Russian team. This catch was made from the box nearest the only bridge splitting the five section areas. 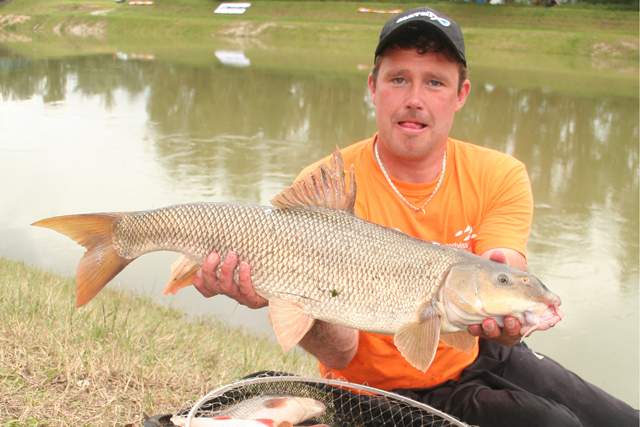 Team mate Ivan Kutishchev had a great final practice, topped by this 4.5kg barbel. This would be his best catch of the whole week! 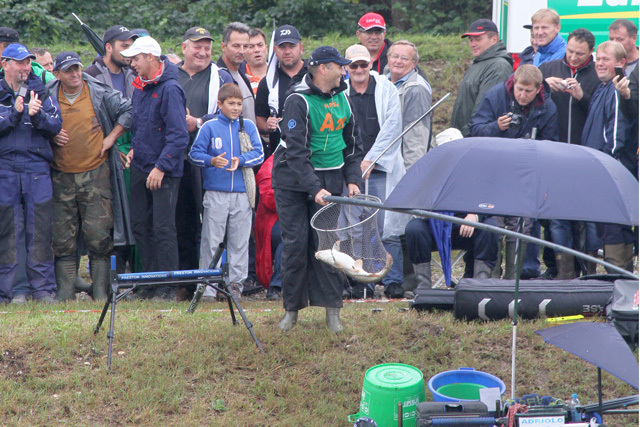 Team mate Ivan Kutishchev had a great final practice, topped by this 4.5kg barbel. This would be his best catch of the whole week! We follow it with the first of several Saturday Galleries focusing first on Section A.
England's Callum Dicks balls in on his first match at world level from peg A2. England's Callum Dicks balls in on his first match at world level from peg A2. 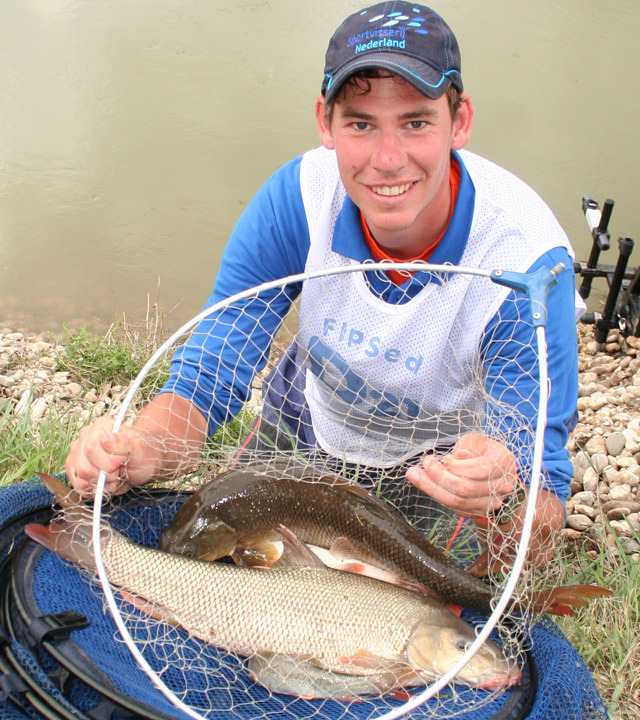 Callum nets the first fish in his first World Champs! 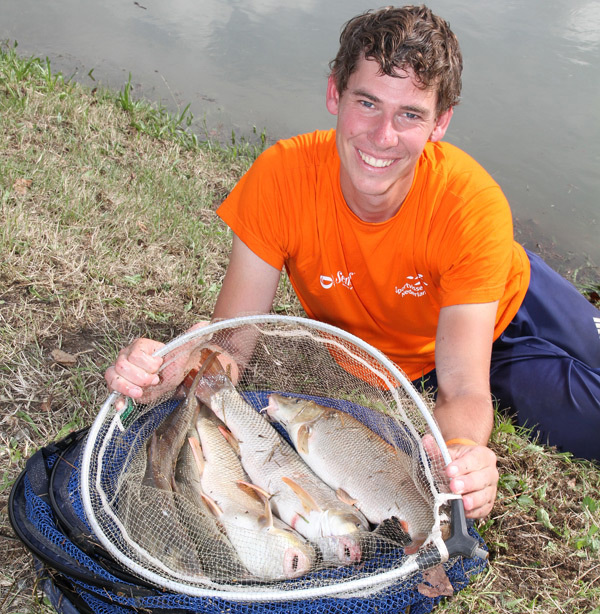 Callum nets the first fish in his first World Champs! 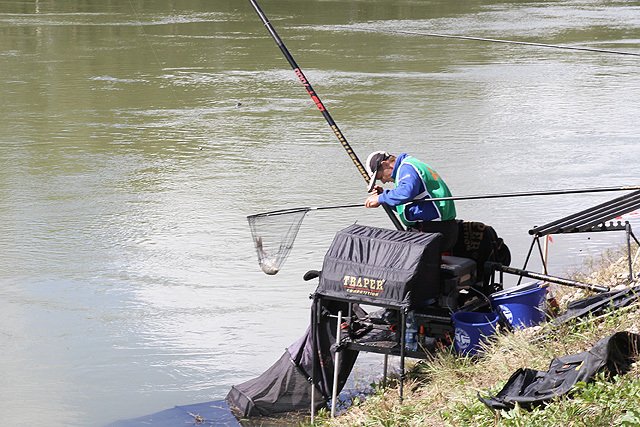 Shot from the opposite bank, we see Callum bending into a decent fish with his father Paul looking on. 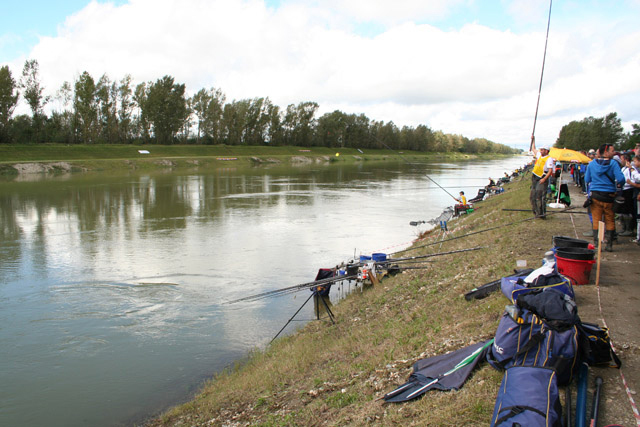 Shot from the opposite bank, we see Callum bending into a decent fish with his father Paul looking on. Callum knows he's beaten the anglers either side of him, but where will this weight put him in his section? Callum knows he's beaten the anglers either side of him, but where will this weight put him in his section? Callum has been all smiles during the week and this catch of 10 fish for 4.699kgs gives him a 7th in section. Callum has been all smiles during the week and this catch of 10 fish for 4.699kgs gives him a 7th in section. The tiny Channel Isles has never seen such a venue, much like many others, but captain Greig Brown seemed to handle the first day well. The tiny Channel Isles has never seen such a venue, much like many others, but captain Greig Brown seemed to handle the first day well. This catch of 4.630kgs was only narrowly beaten by Callum two pegs away, but it earned Greig 8 points for his team, the best that would be registered for the whole weekend. This catch of 4.630kgs was only narrowly beaten by Callum two pegs away, but it earned Greig 8 points for his team, the best that would be registered for the whole weekend. Spain's Mario Mateo nets another lively nase on his way to a section win. Spain's Mario Mateo nets another lively nase on his way to a section win. 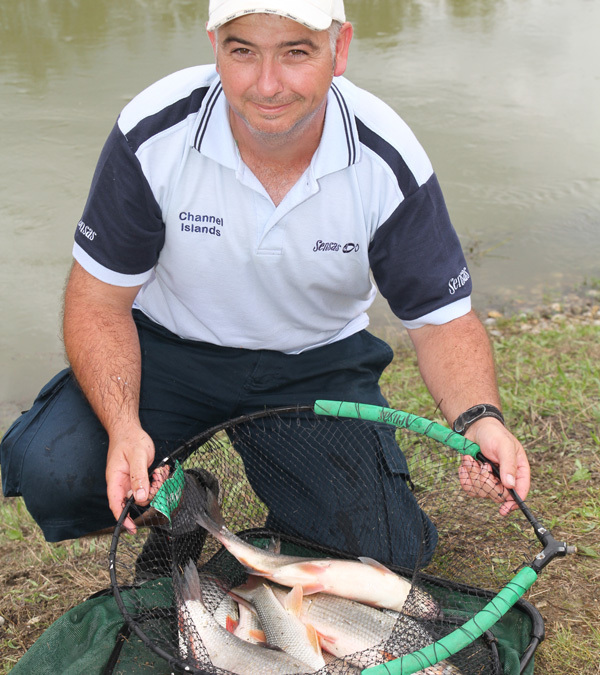 Mario's catch of 7,404kgs got the section verdict in a tight finish. 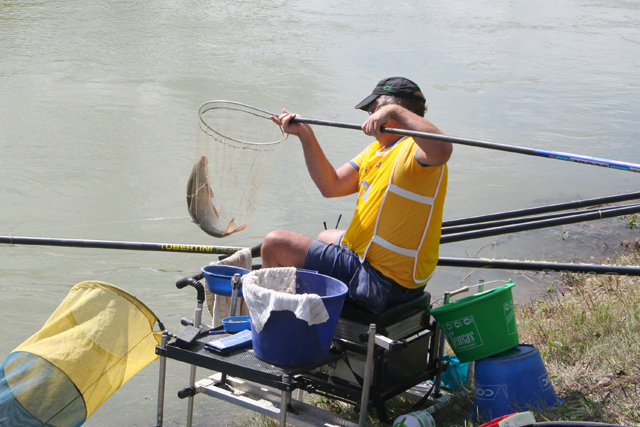 Mario's catch of 7,404kgs got the section verdict in a tight finish. a 3 kilo plus barbel which gave him a total weight of 5,120kgs, to finish just in front of Callum Dicks. a 3 kilo plus barbel which gave him a total weight of 5,120kgs, to finish just in front of Callum Dicks. 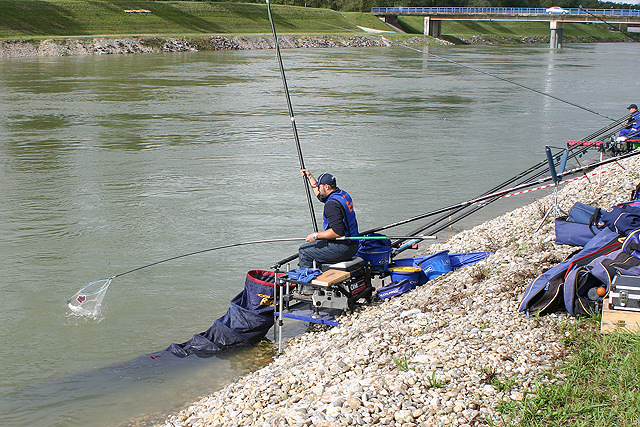 This seemed to be a good way of pulling the fish out of the strong current for Germany's Heiko Schmidt. 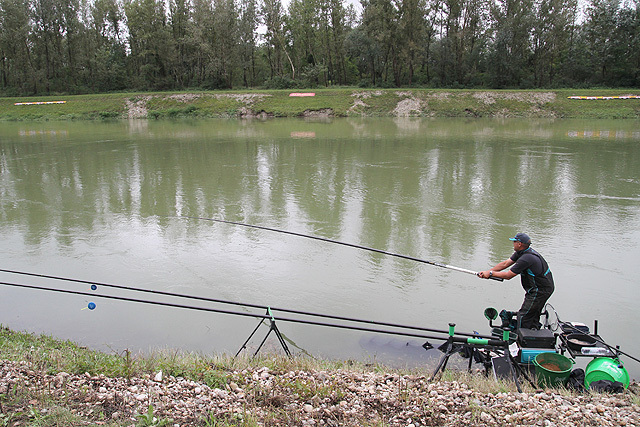 This seemed to be a good way of pulling the fish out of the strong current for Germany's Heiko Schmidt. With the fish safely netted, Heiko returns to his seat. Unfortunately it didn't help him get past Callum, Greig or Wiktor, because he finished with 4,199kgs for a 9th in section. With the fish safely netted, Heiko returns to his seat. Unfortunately it didn't help him get past Callum, Greig or Wiktor, because he finished with 4,199kgs for a 9th in section. 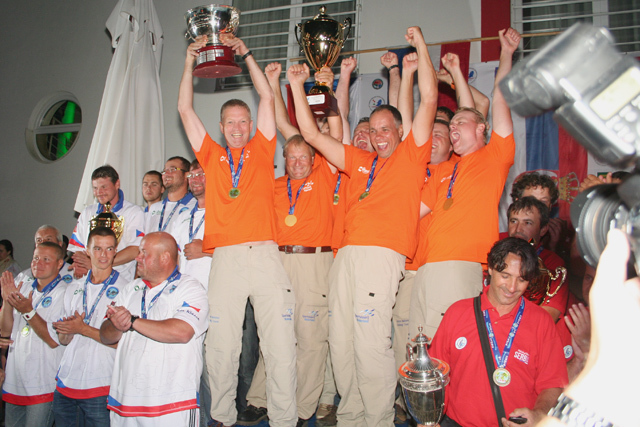 Poland fielded a strong team here, including the 2011 European Champion Wiktor Walczk. 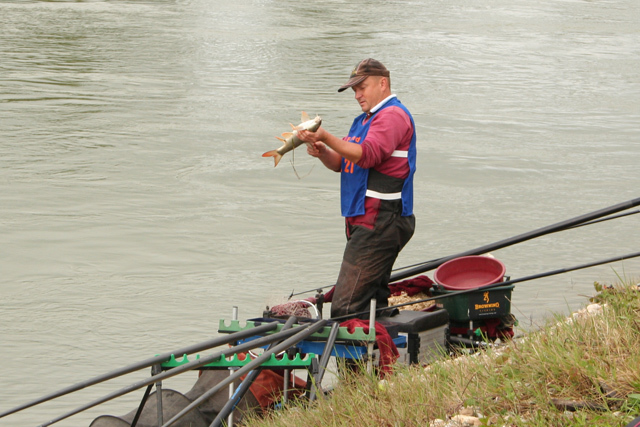 Here he bends into a strong barbel. 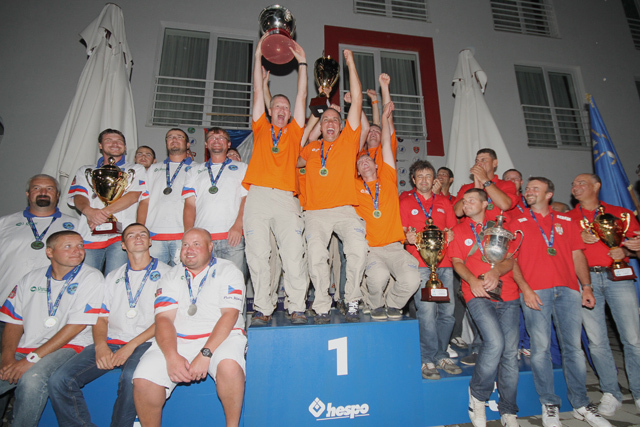 Poland fielded a strong team here, including the 2011 European Champion Wiktor Walczk. Here he bends into a strong barbel. 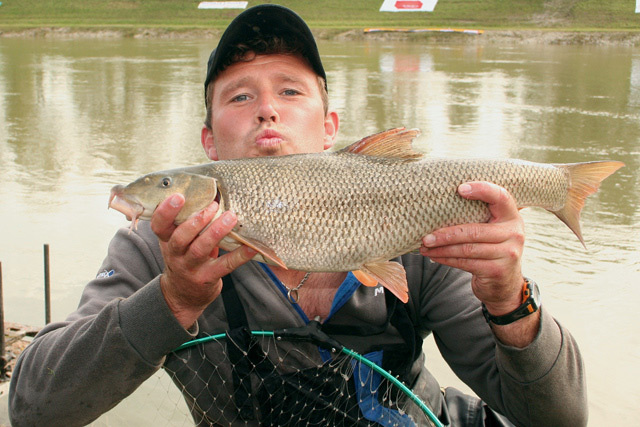 Wiktor safely nets this barbel to give him a second in section. It actually weighed more than the whole of his 2011 match! His final weight here of 7,365kgs was somewhat different from that 2011 result. Then he weighed in 70 fish for 1,255kgs! Wiktor safely nets this barbel to give him a second in section. It actually weighed more than the whole of his 2011 match! His final weight here of 7,365kgs was somewhat different from that 2011 result. Then he weighed in 70 fish for 1,255kgs! 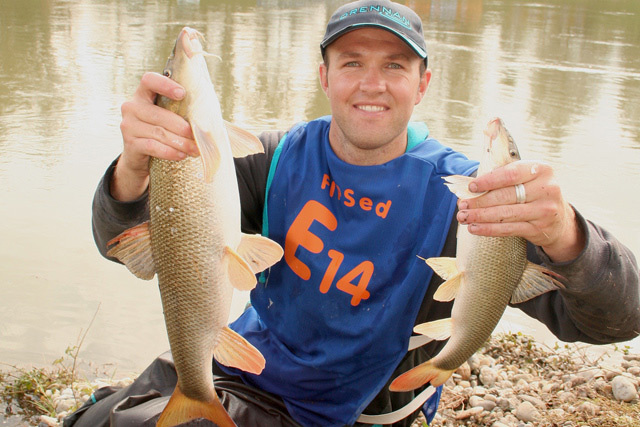 Irish star Jason Ward tries to net a strong fighting barbel in the heavy current. 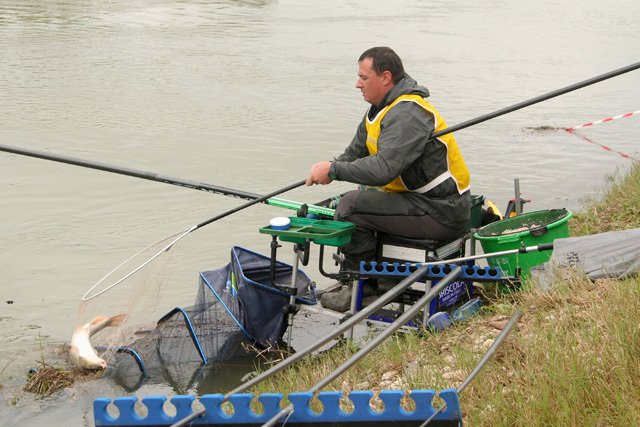 Irish star Jason Ward tries to net a strong fighting barbel in the heavy current. 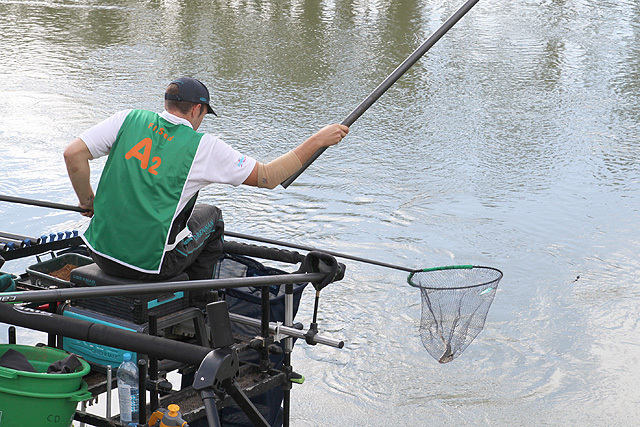 With his fish safely in the net, Jason can look forward to a memorable section win for his team, which found themselves in 13th place, just above England after day 1...this position would change dramatically after day 2! 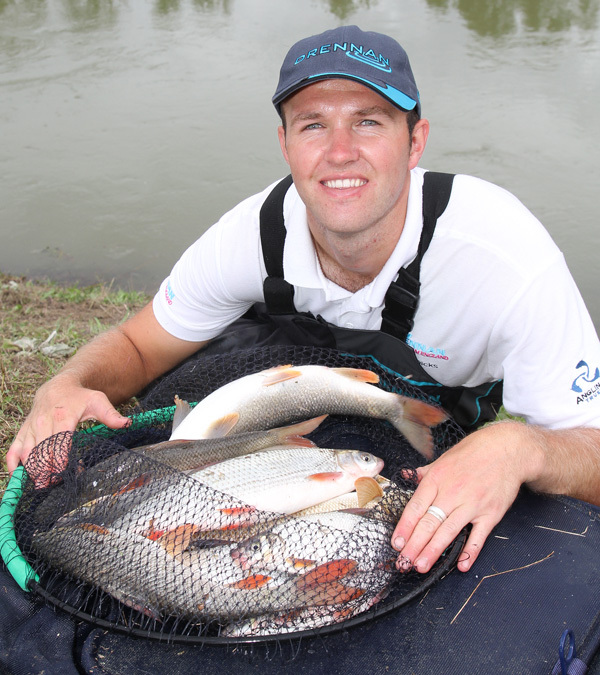 With his fish safely in the net, Jason can look forward to a memorable section win for his team, which found themselves in 13th place, just above England after day 1...this position would change dramatically after day 2! 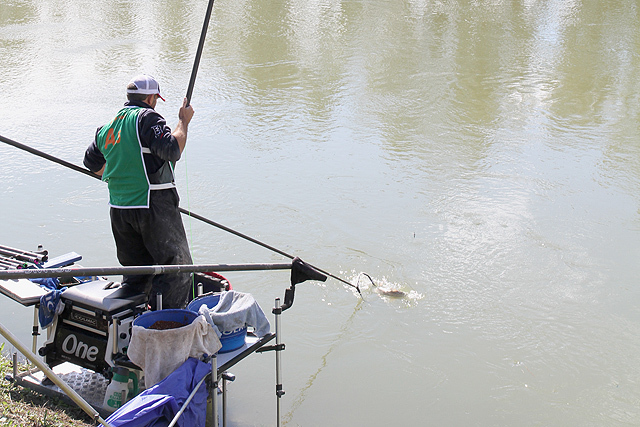 Italy's Ferruccio Gabba keeps a tight hold on this fish on C1. 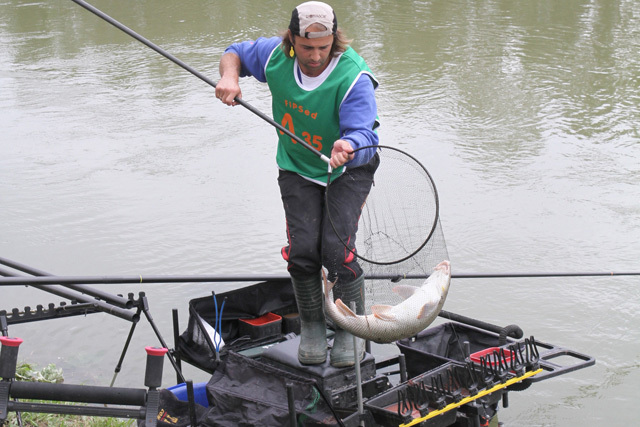 Italy's Ferruccio Gabba keeps a tight hold on this fish on C1. Ferruccio returns with the fish safely in the net. 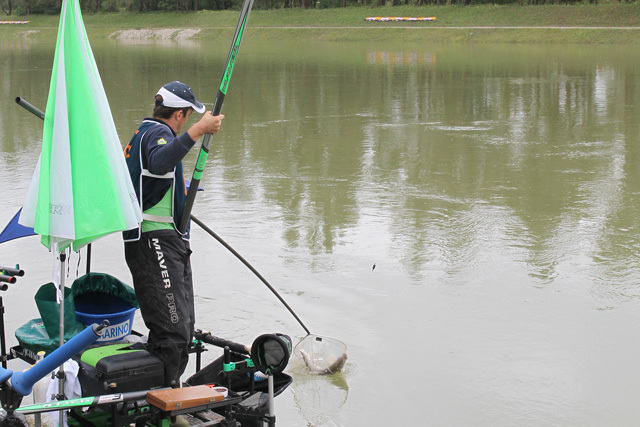 He would win a 2nd in section with 8,176kgs and be the highest placed Italian angler over the whole weekend in what would be an unbelievable disaster for the team! Ferruccio returns with the fish safely in the net. 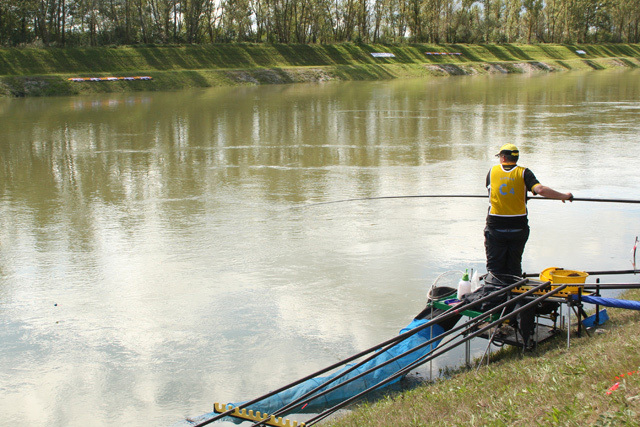 He would win a 2nd in section with 8,176kgs and be the highest placed Italian angler over the whole weekend in what would be an unbelievable disaster for the team! and eventually nets it safely. Bob finish 7th in his section with 4.825kgs. and eventually nets it safely. Bob finish 7th in his section with 4.825kgs. 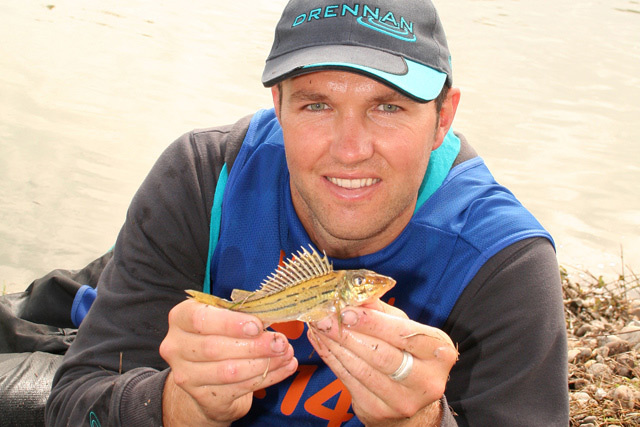 Next door to Bob was Holland's Arjan Klop who is also hanging on to a fish in the powerful current. 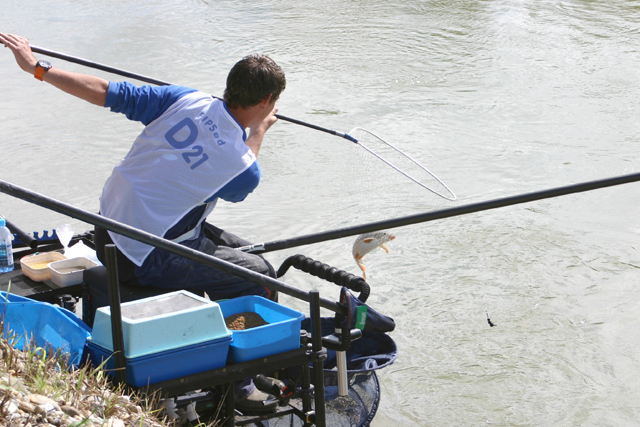 Next door to Bob was Holland's Arjan Klop who is also hanging on to a fish in the powerful current. 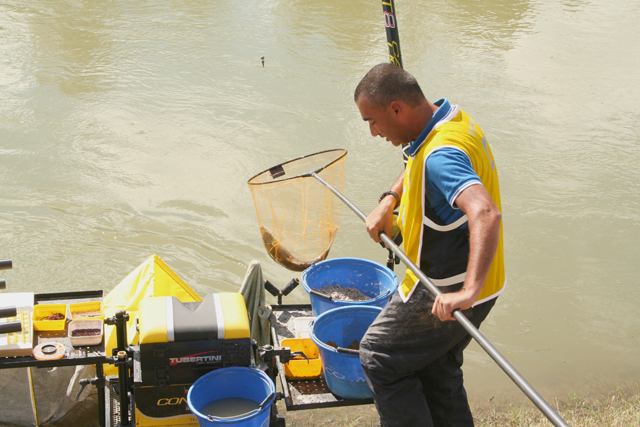 Arjan brings what looks to be a nase upstream, ready for netting. It would be one of the smaller catches in his keepnet!!! Arjan brings what looks to be a nase upstream, ready for netting. It would be one of the smaller catches in his keepnet!!! This was a little larger than that nase, a 4.6kg+ barbel, which secured him the section win in the first part of C section. Arjan, like the rest of his Dutch team, would go on to greater things during day 2. This was a little larger than that nase, a 4.6kg+ barbel, which secured him the section win in the first part of C section. Arjan, like the rest of his Dutch team, would go on to greater things during day 2. 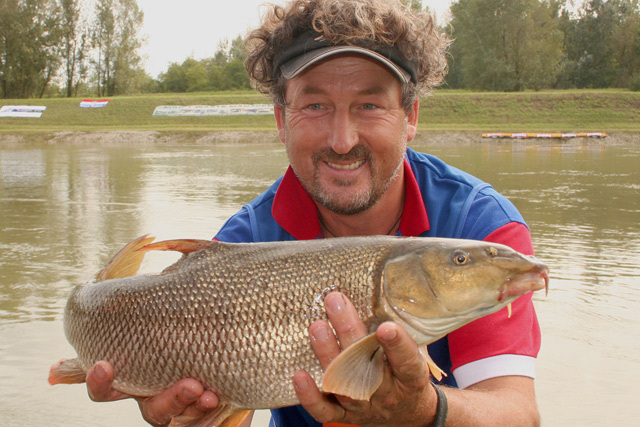 Another angler that found one of the channel's larger barbel was Germany's Rene Bredereck. Here he displays the German style of bringing a big fish to the net, but he is getting very close to his 'zone' boundary which could see him disqualified if he steps out of it! 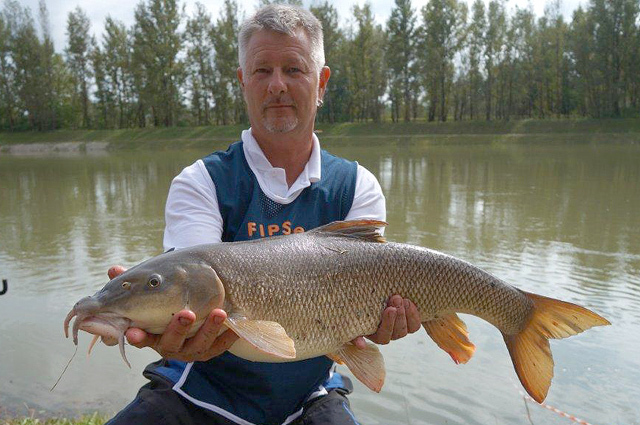 Another angler that found one of the channel's larger barbel was Germany's Rene Bredereck. Here he displays the German style of bringing a big fish to the net, but he is getting very close to his 'zone' boundary which could see him disqualified if he steps out of it! 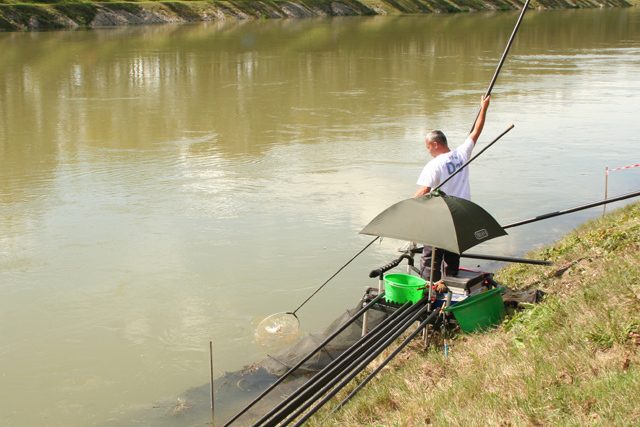 But Rene is an expert in netting large fish this way and he begins to come back down the zone as the fish tires. 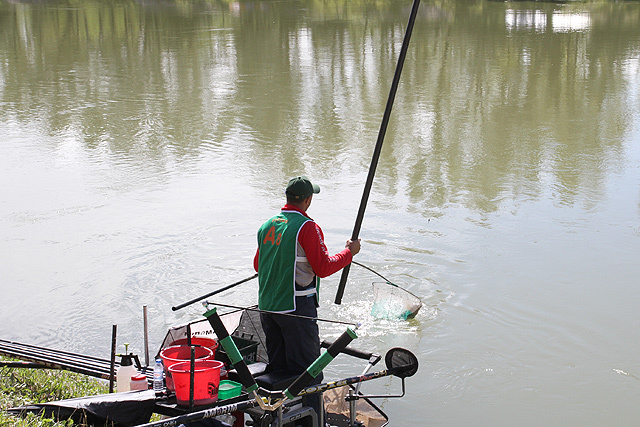 But Rene is an expert in netting large fish this way and he begins to come back down the zone as the fish tires. 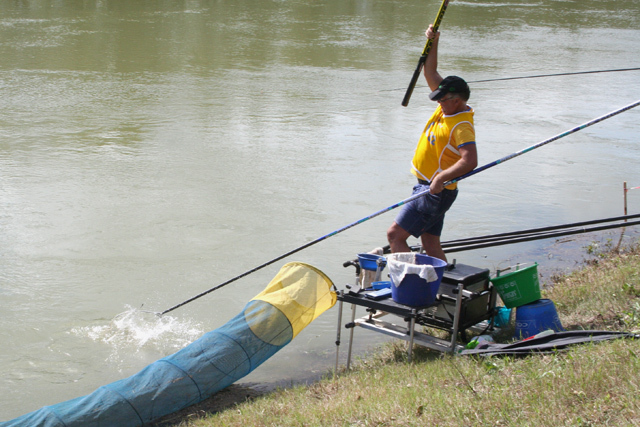 With an extra long landing net handle at around 6m, he begins to guide the big fish into his net. 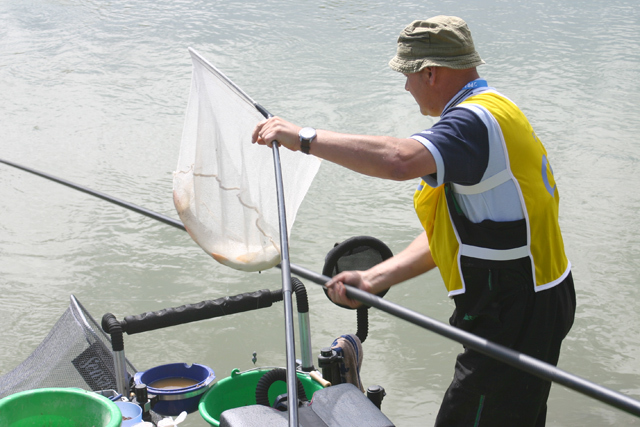 With an extra long landing net handle at around 6m, he begins to guide the big fish into his net. After an incredible fight, Rene is relieved to bring the fish safely up the bank to an appreciative applause from the large gallery behind him. Rene finished with just two fish for 4.435kgs, so we know that his other fish was a lot smaller!!! After an incredible fight, Rene is relieved to bring the fish safely up the bank to an appreciative applause from the large gallery behind him. Rene finished with just two fish for 4.435kgs, so we know that his other fish was a lot smaller!!! 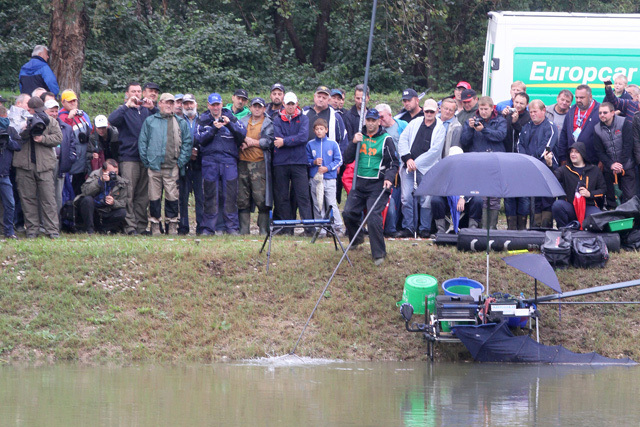 San Marino angler, Giancarlo Fusini, puts some pressure on a good fish on C10. 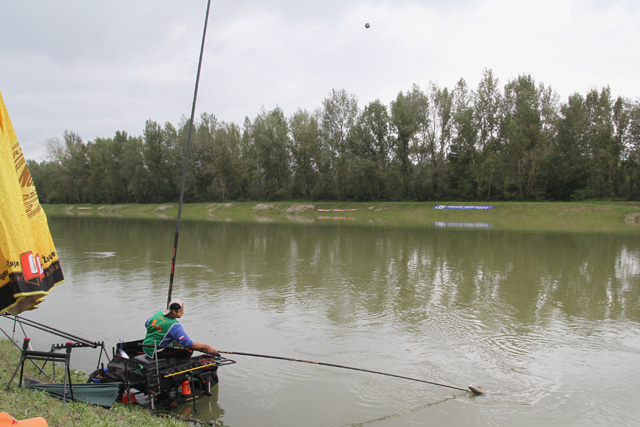 San Marino angler, Giancarlo Fusini, puts some pressure on a good fish on C10. 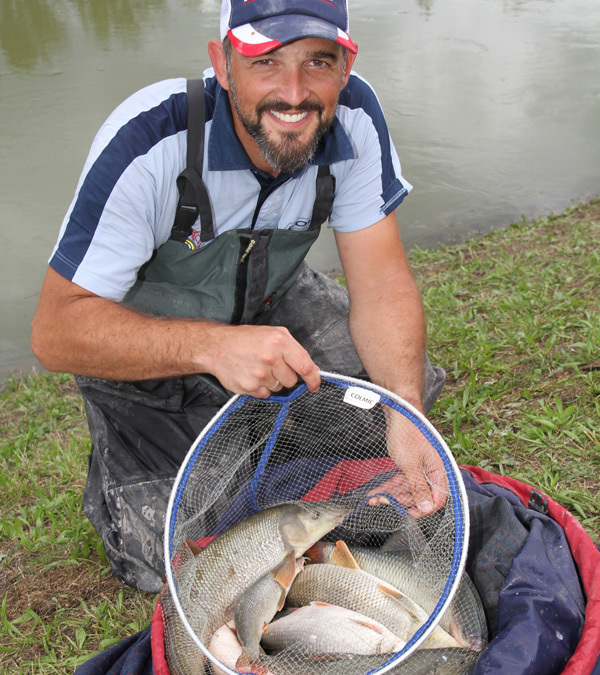 With the fish safely netted, Giancarlo can look forward to a 3rd in section with 7,761kgs, only narrowly missing out to Italy's Ferruccio Gabba by just over 400 grams. San Marino, sometimes known as the 'Italian B team', would eventually take the 'scalp' of their more illustrious neighbour... AGAIN... much like in Spinadesco in 2008! 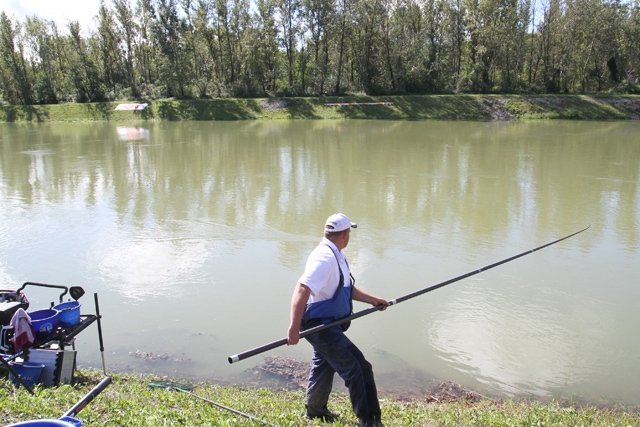 With the fish safely netted, Giancarlo can look forward to a 3rd in section with 7,761kgs, only narrowly missing out to Italy's Ferruccio Gabba by just over 400 grams. San Marino, sometimes known as the 'Italian B team', would eventually take the 'scalp' of their more illustrious neighbour... AGAIN... much like in Spinadesco in 2008! he was wrong. This was the only fish of the day for him, which weighed 1,274kgs to give him a 14th place in the section. Having gained valuable experience of this type of fishing over the week, I'm sure he will be looking forward to competing on another similar style venue (maybe!). he was wrong. This was the only fish of the day for him, which weighed 1,274kgs to give him a 14th place in the section. Having gained valuable experience of this type of fishing over the week, I'm sure he will be looking forward to competing on another similar style venue (maybe!). but he eventually nets a fine barbel to add to his overall section weight of 5,645, which earned him a well deserved 2nd in section. His team finished on 50.5pts for the first day for 17th place, but day 2 would prove better and they improved greatly to finish in 12th place overall. but he eventually nets a fine barbel to add to his overall section weight of 5,645, which earned him a well deserved 2nd in section. His team finished on 50.5pts for the first day for 17th place, but day 2 would prove better and they improved greatly to finish in 12th place overall. Hakan's neighbour, Erik Finn Lerdalen from Norway, was only 2 pegs away and like Hakan produced a good first day's result. Hakan's neighbour, Erik Finn Lerdalen from Norway, was only 2 pegs away and like Hakan produced a good first day's result. This decent barbel added to Erik's total weight of 3,983kgs to give him a 6th in section. He would be Norway's best angler over the two days. This decent barbel added to Erik's total weight of 3,983kgs to give him a 6th in section. He would be Norway's best angler over the two days. which he proudly holds up for the camera (No, he didn't drop it!). 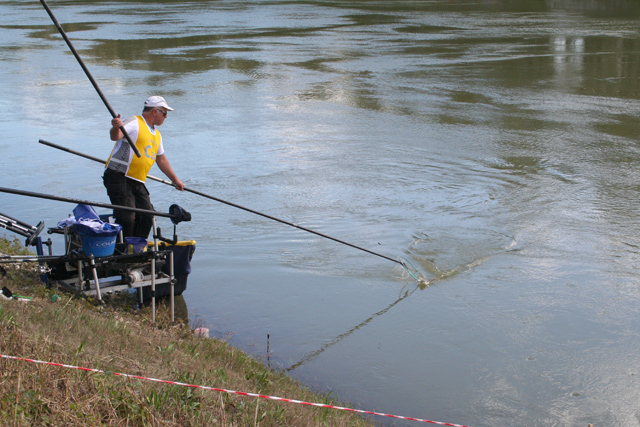 The Czech team nearly pulled off a remarkable victory against the odds, but obviously had some knowledge of this type of fishing. Their day 1 and 2 scores of 25 and 19 points respectively, was testament to their undoubted abilities on this venue. which he proudly holds up for the camera (No, he didn't drop it!). 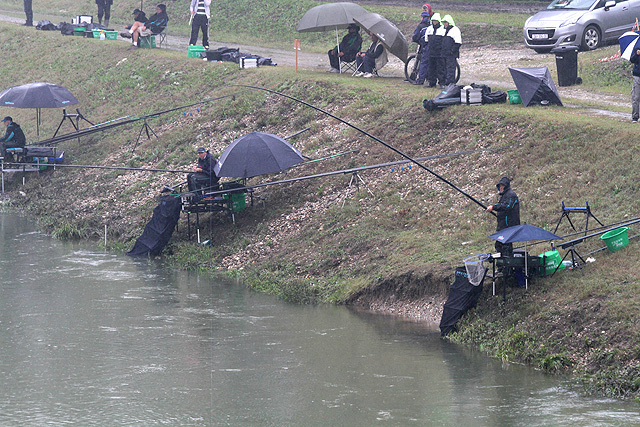 The Czech team nearly pulled off a remarkable victory against the odds, but obviously had some knowledge of this type of fishing. Their day 1 and 2 scores of 25 and 19 points respectively, was testament to their undoubted abilities on this venue. 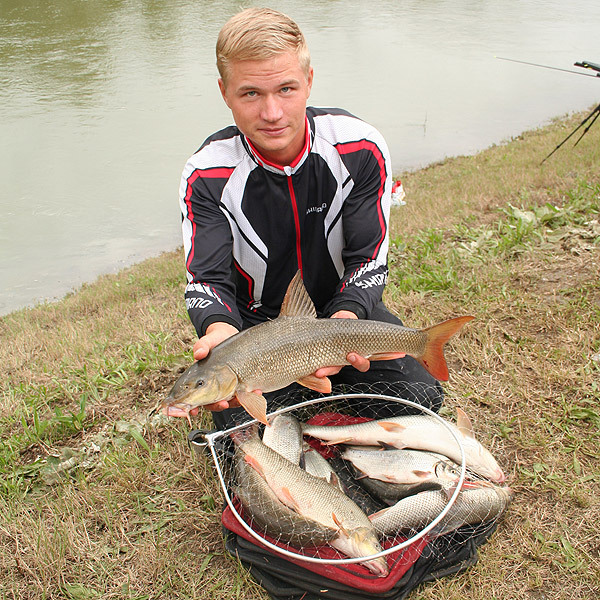 Norway's Niklas Strengelsrud brings a small barbel, of which there were many in the channel, upstream ready for netting. Norway's Niklas Strengelsrud brings a small barbel, of which there were many in the channel, upstream ready for netting. With only 3 fish for a total weight just under a kilo, Niklas, like so many others, struggled to come to terms with this venue. What was even worse for him and his team was that their neighbours Sweden beat them in all but one of the sections to take the Scandinavian honours (Denmark were absent from this year), but they did beat Finland! With only 3 fish for a total weight just under a kilo, Niklas, like so many others, struggled to come to terms with this venue. What was even worse for him and his team was that their neighbours Sweden beat them in all but one of the sections to take the Scandinavian honours (Denmark were absent from this year), but they did beat Finland! 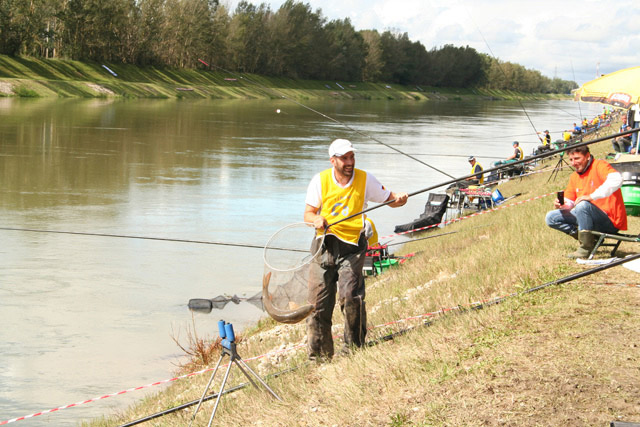 We did not manage to get any action shots of Mr. Barbel, but we have his day 1 section winning catchshot as consolation. See our video in the Diaries section for more on Goran. 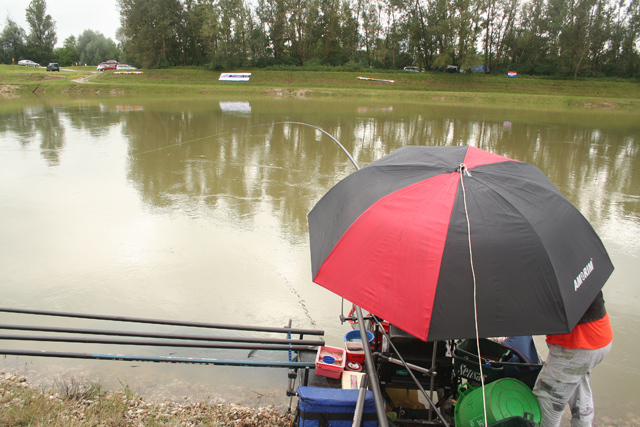 We did not manage to get any action shots of Mr. Barbel, but we have his day 1 section winning catchshot as consolation. See our video in the Diaries section for more on Goran. Another Dutchman who produced an exceptional result for his team, Stefan (Jurgan!) 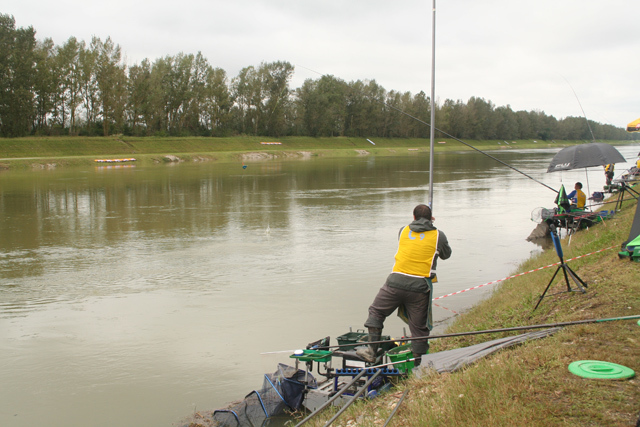 Altena, nets a small barbel. Another Dutchman who produced an exceptional result for his team, Stefan (Jurgan!) 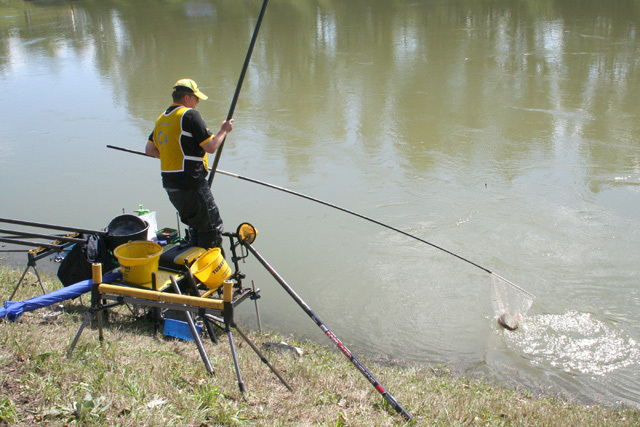 Altena, nets a small barbel. Stefan drew peg D21 and finished the day with 5,335kgs to take the section by just over a 100 grams. Stefan drew peg D21 and finished the day with 5,335kgs to take the section by just over a 100 grams. 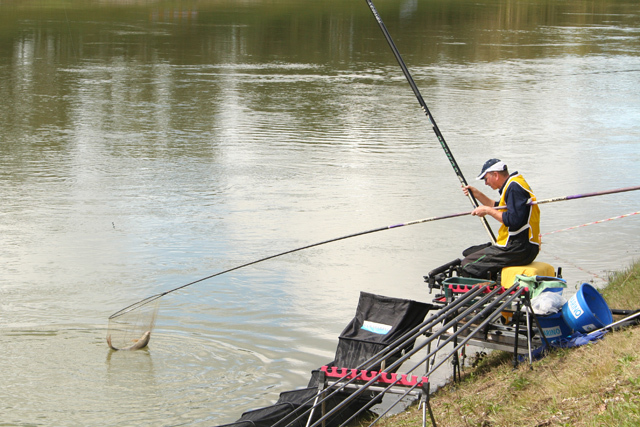 This catchshot of Stefan was topped by a couple of 2 kilo plus barbel and set him up for an individual medal on day 2. 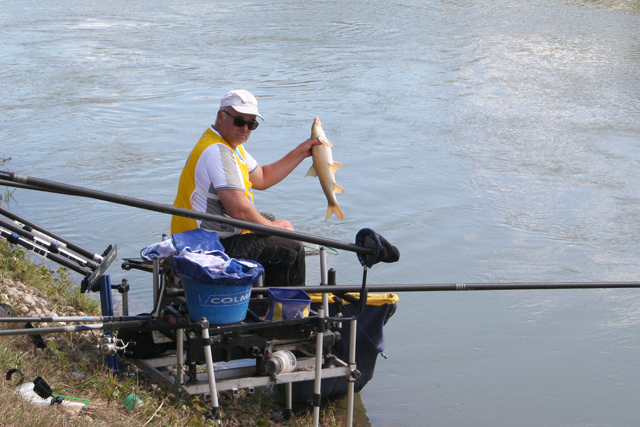 This catchshot of Stefan was topped by a couple of 2 kilo plus barbel and set him up for an individual medal on day 2. 2013 European Champion Szilárd Szilvási came very close to taking his section with 5,208kgs, only losing it to Stefan Altena by 127 grams! 2013 European Champion Szilárd Szilvási came very close to taking his section with 5,208kgs, only losing it to Stefan Altena by 127 grams! A terrible day 2 put Szilárd totally out of the medals with a dismal 16th from A16. A terrible day 2 put Szilárd totally out of the medals with a dismal 16th from A16. A nightmare start for Bulgarian Marian Marinov when he lost his top 5s while playing a fish. A nightmare start for Bulgarian Marian Marinov when he lost his top 5s while playing a fish. Marian had to go down his zone quickly before the pole section went totally under. Marian had to go down his zone quickly before the pole section went totally under. He was fortunate to retrieve the sections, but unfortunately lost his fish, which could have pushed him several places higher in the section. As it was, he finished in 8th place with a total weight of 2,030kgs. He was fortunate to retrieve the sections, but unfortunately lost his fish, which could have pushed him several places higher in the section. As it was, he finished in 8th place with a total weight of 2,030kgs. 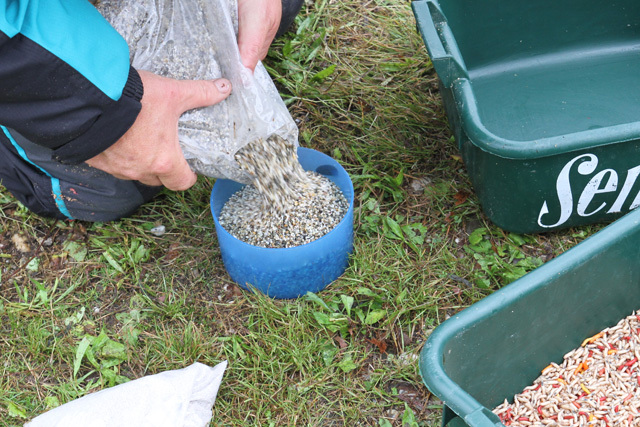 The start of day 1 for Russian Sergey Fedorov as he mixes his groundbait on E17. 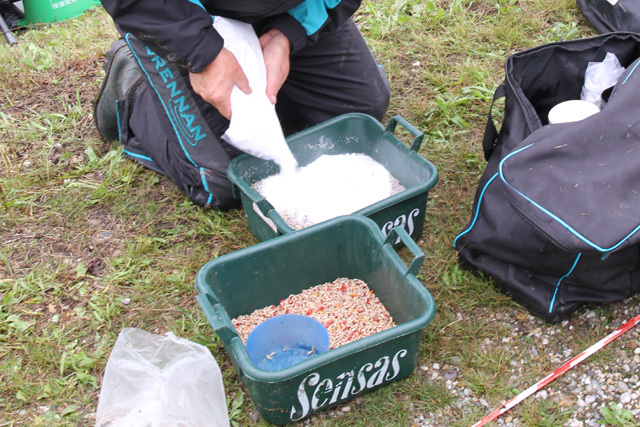 The start of day 1 for Russian Sergey Fedorov as he mixes his groundbait on E17. 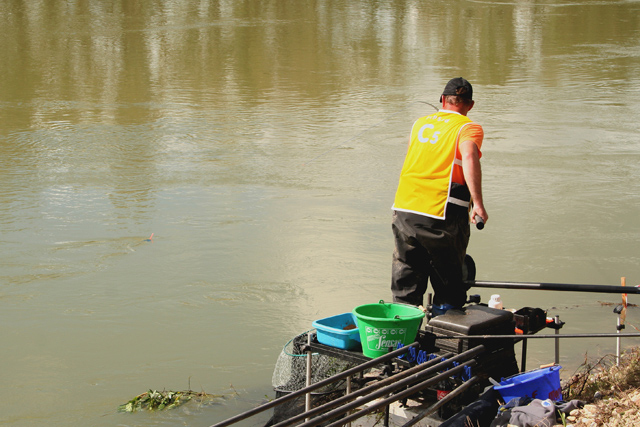 Sergey's balls of GB with plenty of dead maggot and bloodworm were not enough to give him any points, as he was one of three anglers to blank in this section. There were 17 blanks in total for day 1. 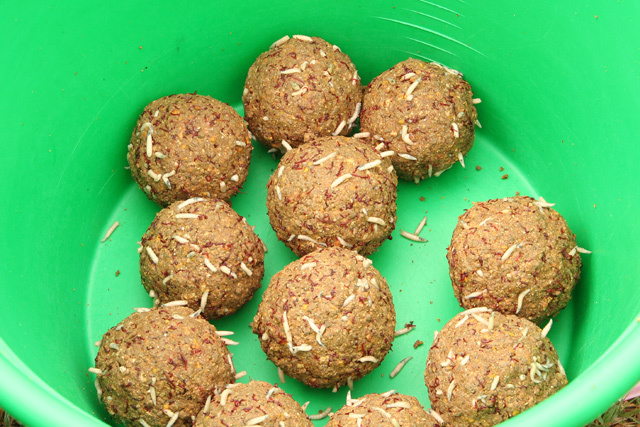 Sergey's balls of GB with plenty of dead maggot and bloodworm were not enough to give him any points, as he was one of three anglers to blank in this section. There were 17 blanks in total for day 1. This fish was the very first one caught in the Championships, but Austrian star Mario Litschl could not count it, as it was caught while he was plumbing up! His final (legal) weight of 3,756kgs earned him a 6th in section. This fish was the very first one caught in the Championships, but Austrian star Mario Litschl could not count it, as it was caught while he was plumbing up! His final (legal) weight of 3,756kgs earned him a 6th in section. 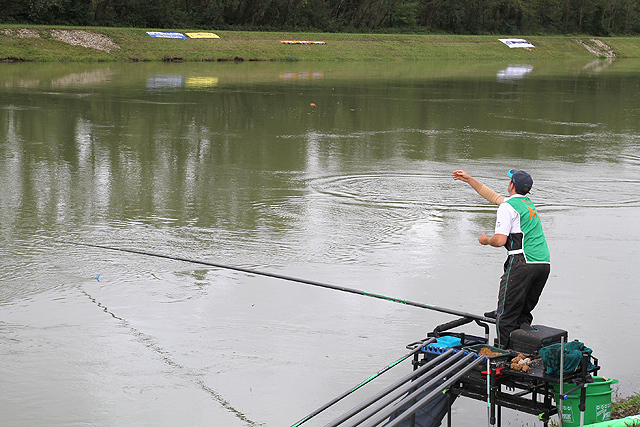 Spaniard Cristian Castanedo pulls on a good fish shortly after the start. 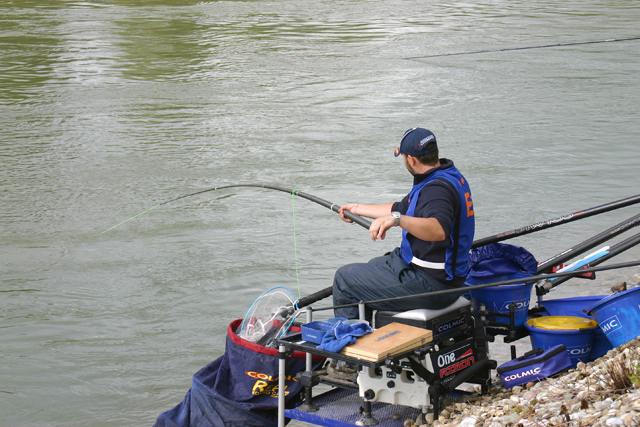 Spaniard Cristian Castanedo pulls on a good fish shortly after the start. 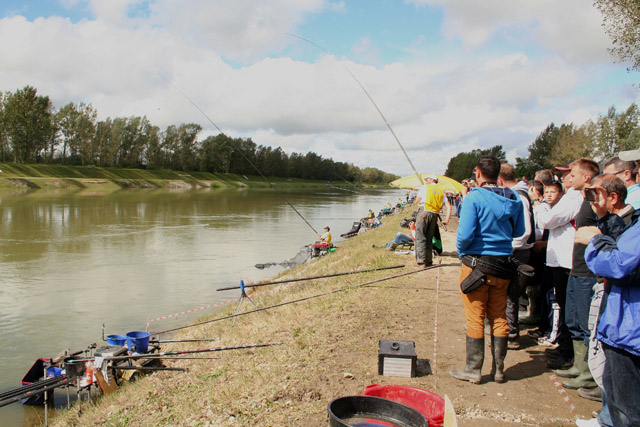 but this 1,442kg nase was the only fish he landed, so he ended with only 12th in section which saw 2 blanks. 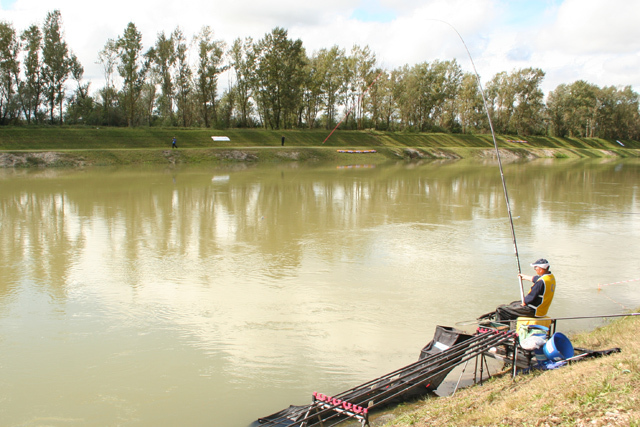 but this 1,442kg nase was the only fish he landed, so he ended with only 12th in section which saw 2 blanks. The end of day 1 found the Dutch team chilling out in one of the bankside cafe's after the match, no doubt very satisfied with their day's work! The end of day 1 found the Dutch team chilling out in one of the bankside cafe's after the match, no doubt very satisfied with their day's work! Our final set of Galleries focusses on Sunday, featuring over 40 photos of the day's action and closing ceremony. 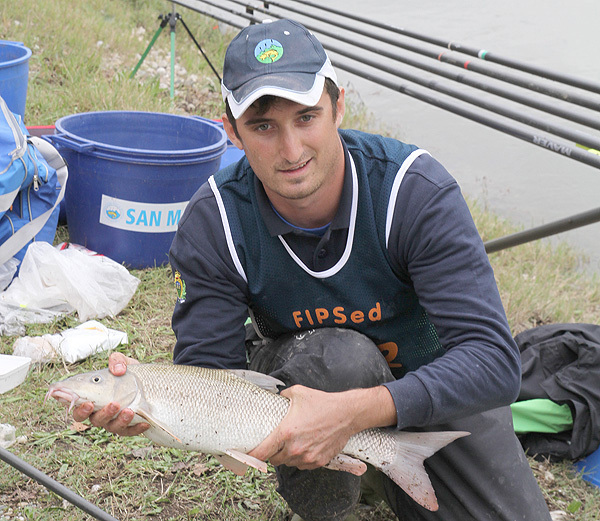 Russia's Yury Radugin stood in for day 1 team mate Sergey Fedorov and found a few fish at A4 for 2,991kgs and 6th in section. 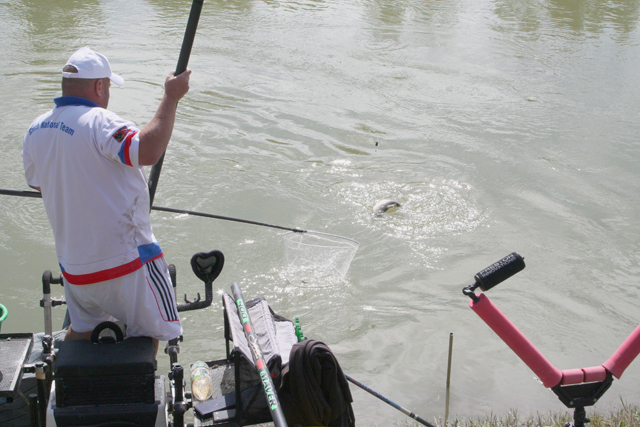 Russia's Yury Radugin stood in for day 1 team mate Sergey Fedorov and found a few fish at A4 for 2,991kgs and 6th in section. 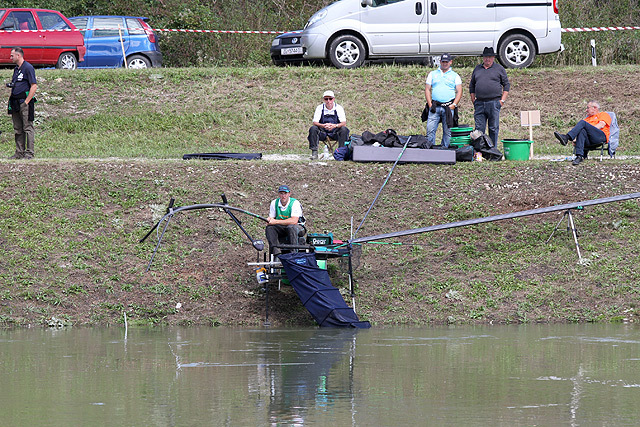 England's Steve Hemingray on A12, with a catch that gave him a 5th in section, just 322 grams in front of Yury. Steve's weight was courtesy of this fine barbel. 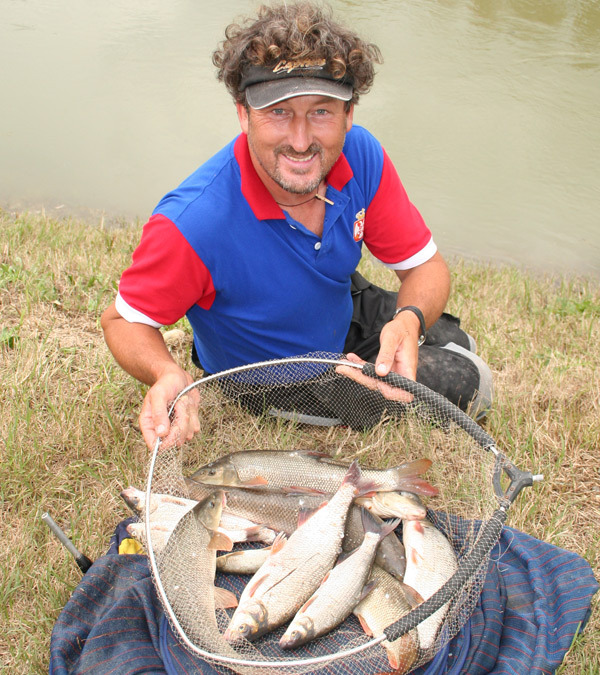 England's Steve Hemingray on A12, with a catch that gave him a 5th in section, just 322 grams in front of Yury. Steve's weight was courtesy of this fine barbel. We managed to place a camera on the opposite bank and got some great shots. Here is Holland's Jo Adriolo playing a big fish in front of a large gallery on A29. We managed to place a camera on the opposite bank and got some great shots. Here is Holland's Jo Adriolo playing a big fish in front of a large gallery on A29. Jo managed to tame the 'beast', a barbel of just under 4kgs, much to the delight of the gallery and himself. Jo managed to tame the 'beast', a barbel of just under 4kgs, much to the delight of the gallery and himself. Not a bad fish for Jo and the team. Without it he would have been well down his section and the team would have been out of the medals... but luck is what Holland got in this Championships... and it was long overdue! Not a bad fish for Jo and the team. Without it he would have been well down his section and the team would have been out of the medals... but luck is what Holland got in this Championships... and it was long overdue! Poland's rising star Michal Lebkowski, brings another big fish to the net close to Jo on A35. Poland's rising star Michal Lebkowski, brings another big fish to the net close to Jo on A35. It's clear when you look at this fish in the net that it's true size can be fully appreciated. These large fish where sometimes the difference between top of the section or the bottom. Many more were lost during the weekend and it could have been so different for many other teams, had that not been so! It's clear when you look at this fish in the net that it's true size can be fully appreciated. These large fish where sometimes the difference between top of the section or the bottom. Many more were lost during the weekend and it could have been so different for many other teams, had that not been so! 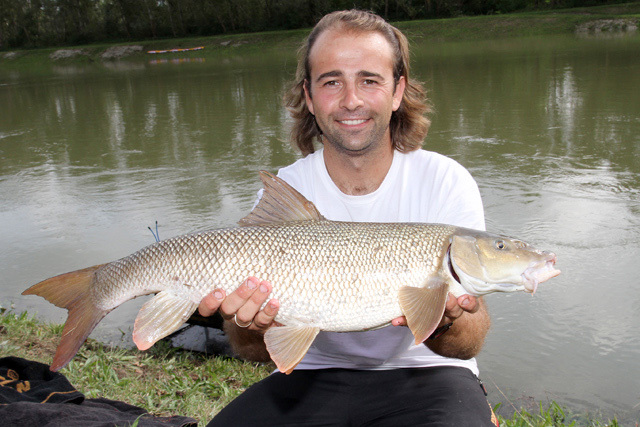 Michal's barbel was a similar size to Jo and like him would have been right down the section without it. It's not always recognised that the skill required to land one of these fish is considerable on pole tackle, but so is the element of luck! 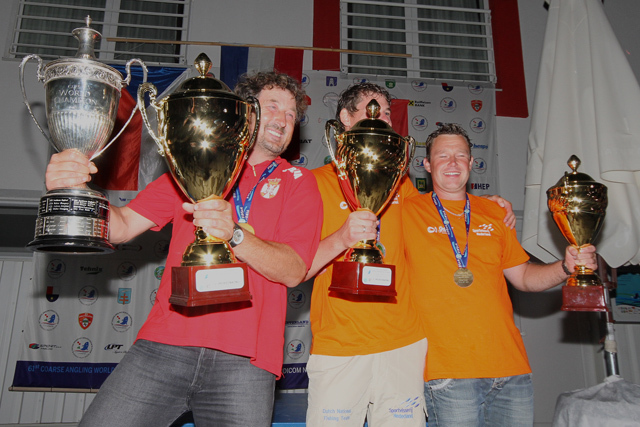 Many stories were common during the Championships about even larger fish being lost! 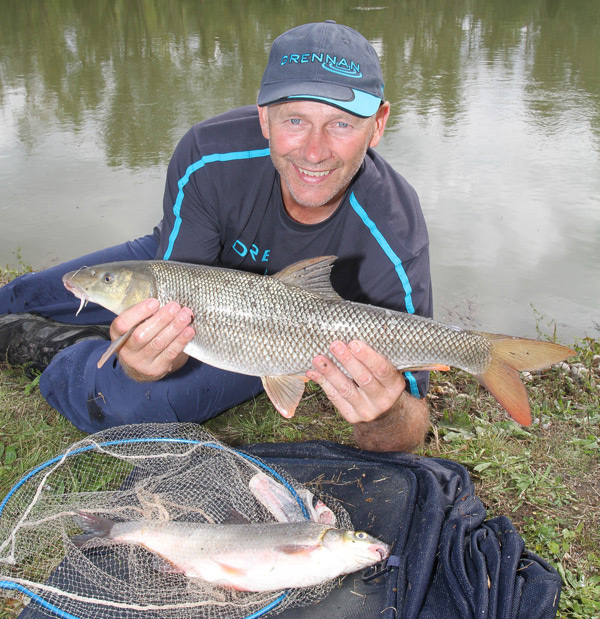 Michal's barbel was a similar size to Jo and like him would have been right down the section without it. It's not always recognised that the skill required to land one of these fish is considerable on pole tackle, but so is the element of luck! 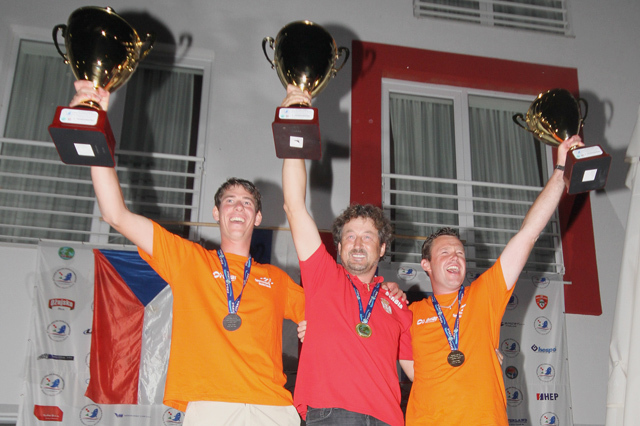 Many stories were common during the Championships about even larger fish being lost! Holland's Stefan Altena has a big smile on his face because he knows he's in with a shout of a gold medal...he also believes his team has one as well! Holland's Stefan Altena has a big smile on his face because he knows he's in with a shout of a gold medal...he also believes his team has one as well! England's Will Raison waits by the scales knowing his team will finish well down the rankings. What a difference a year makes! England's Will Raison waits by the scales knowing his team will finish well down the rankings. What a difference a year makes! Germany do not often figure in World Championships, but after a successful day 1, the team were hopeful of more of the same for day 2. But things didn't go according to plan for many in the team, the exception was Claus Müller on B8, who finished the best of all. Germany do not often figure in World Championships, but after a successful day 1, the team were hopeful of more of the same for day 2. But things didn't go according to plan for many in the team, the exception was Claus Müller on B8, who finished the best of all. Here, Claus has connected with one of the channels monster barbel and was hanging on... he wasn't going to lose this 'whiskers'! Here, Claus has connected with one of the channels monster barbel and was hanging on... he wasn't going to lose this 'whiskers'! After a long battle, Claus managed to net the fish to the appreciation of a massive gallery which had gathered behind him during the fight. After a long battle, Claus managed to net the fish to the appreciation of a massive gallery which had gathered behind him during the fight. Here is that big 'whiskers'... NO, not Claus, but the barbel, which went over four and a half kilos and gave him a 2nd in section. Here is that big 'whiskers'... NO, not Claus, but the barbel, which went over four and a half kilos and gave him a 2nd in section. 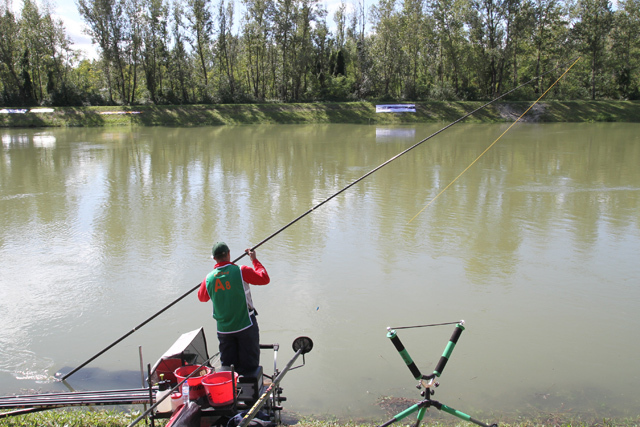 San Marino's Alberto Tasini brings in a near 2kg barbel, which pushed him into a 4th in section for his team. 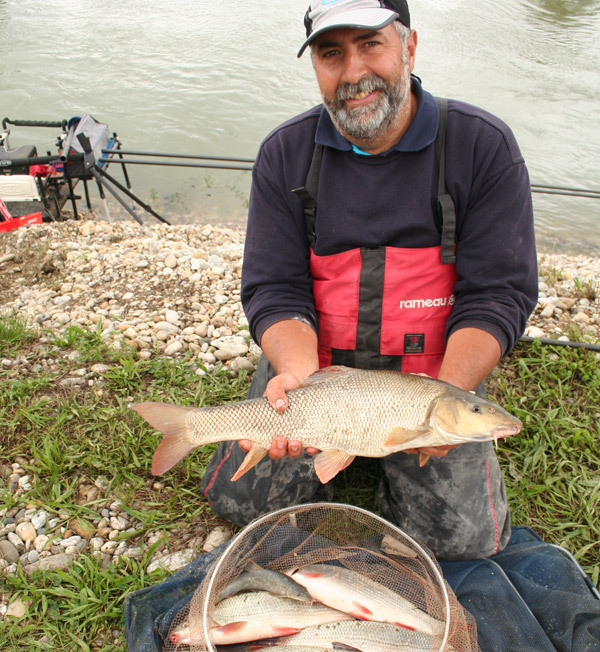 San Marino's Alberto Tasini brings in a near 2kg barbel, which pushed him into a 4th in section for his team. Alberto's team may not have finished in the top ten, but they once more beat their 'big brother' neighbour to show us that there is more to this little nation than meets the eye!!! Alberto's team may not have finished in the top ten, but they once more beat their 'big brother' neighbour to show us that there is more to this little nation than meets the eye!!! 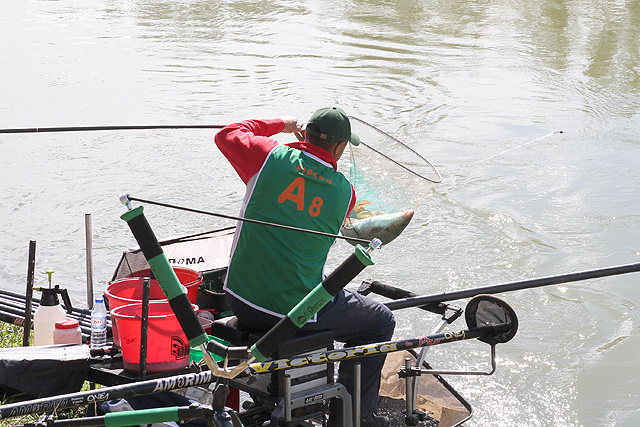 Portugal's José Amorim on C2 can only hold on and a watch, as one very large fish bolts downstream. Portugal's José Amorim on C2 can only hold on and a watch, as one very large fish bolts downstream. José did manage to make some headway with the fish, but lost it shortly afterwards. He finished with seven fish for 4,688kgs. During the weekend many fish were lost, mainly due to foul-hooking, only a few were ever landed! José did manage to make some headway with the fish, but lost it shortly afterwards. He finished with seven fish for 4,688kgs. 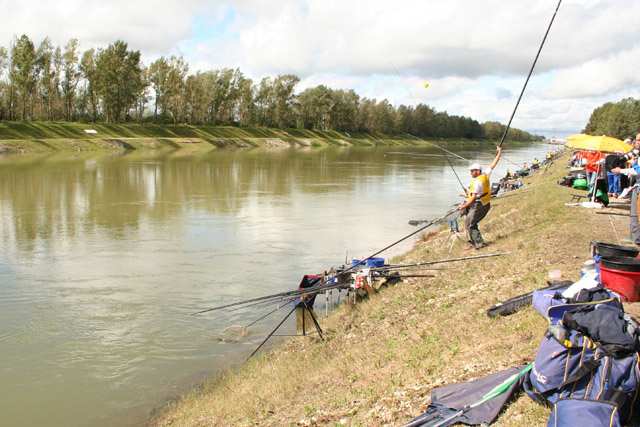 During the weekend many fish were lost, mainly due to foul-hooking, only a few were ever landed! Ukraine did well on the final day, registering 42pts for a final 19th position, due mainly to Dmytro Borsuk and Oleksandr Oblomov scoring 2pts each. Here Dmytro has a good fish on. Ukraine did well on the final day, registering 42pts for a final 19th position, due mainly to Dmytro Borsuk and Oleksandr Oblomov scoring 2pts each. Here Dmytro has a good fish on. 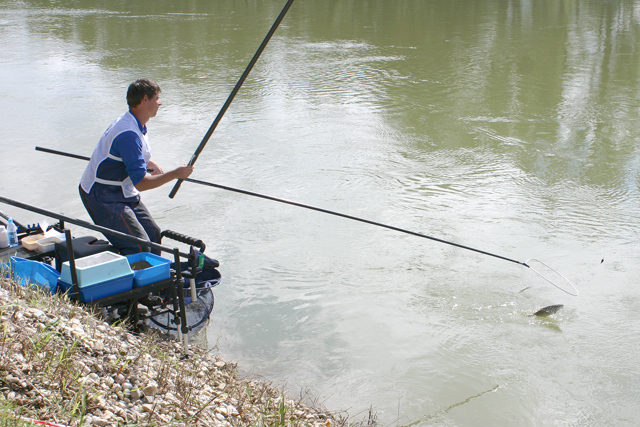 Dmytro manages to safely net the fish, around 3kgs+, to add to his overall 6,396kgs from C9. 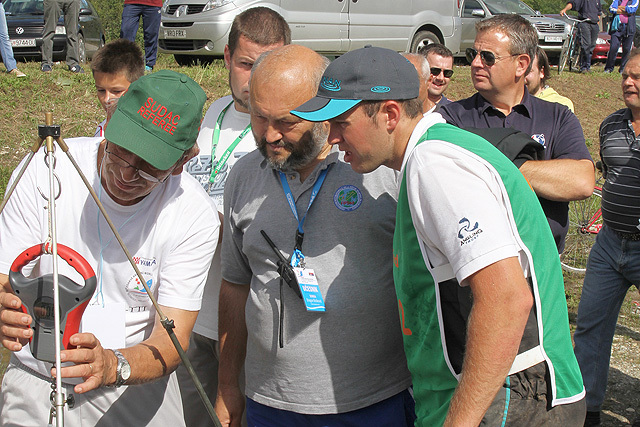 Dmytro manages to safely net the fish, around 3kgs+, to add to his overall 6,396kgs from C9. As he brings the net close, the relief is plain to see! As he brings the net close, the relief is plain to see! 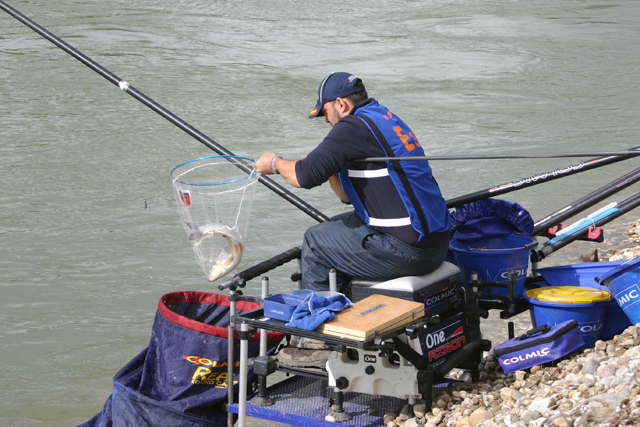 Serbian Milos Pavlicevic with an 8,875kgs catch from C34. Milos was his country's second highest points scorer of the Championships with 5pts. Serbian Milos Pavlicevic with an 8,875kgs catch from C34. Milos was his country's second highest points scorer of the Championships with 5pts. Another top performer for his country on day 2 was Vladimir Danilovic with a 4,684kgs catch from D37. 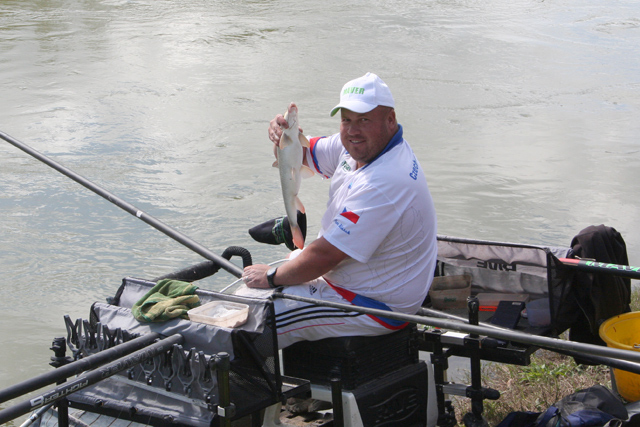 Another top performer for his country on day 2 was Vladimir Danilovic with a 4,684kgs catch from D37. but this strange little catch didn't contribute much to Callum's overall weight, it could only have weighed about 80 grams. Not sure what it is...DOES ANYONE OUT THERE KNOW WHAT IT IS CALLED? but this strange little catch didn't contribute much to Callum's overall weight, it could only have weighed about 80 grams. Not sure what it is...DOES ANYONE OUT THERE KNOW WHAT IT IS CALLED? A delighted Dutchman, Arjan Klop, knows he has been beaten by Goran Radovic, but also knows his 2pts has helped his team to a certain medal...but which one? A delighted Dutchman, Arjan Klop, knows he has been beaten by Goran Radovic, but also knows his 2pts has helped his team to a certain medal...but which one? 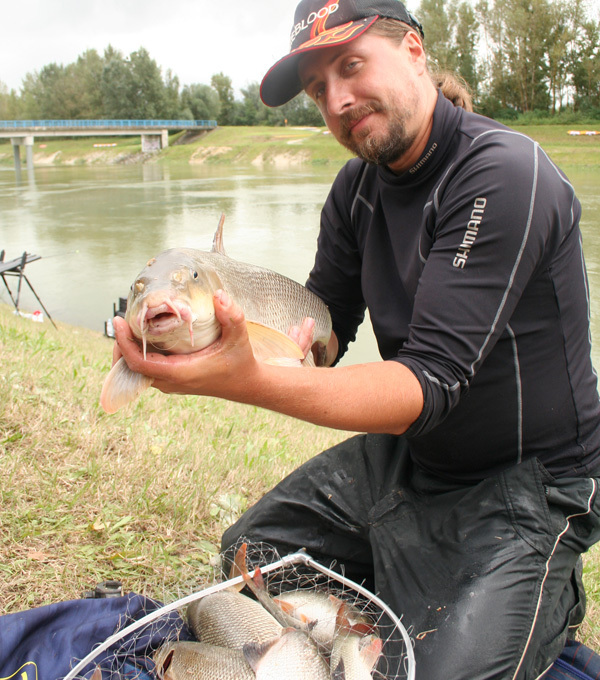 Arjan's catch from E21 included this 2kg+ barbel, which he threatens to give a big kiss to! Arjan's catch from E21 included this 2kg+ barbel, which he threatens to give a big kiss to! This guy from Serbia has finally nailed himself a gold medal with this 10,520 kilos haul from E24. His skill during this tournament has been talked about by an impressed Dutch manager! More may come from this versatile angler in the future. This guy from Serbia has finally nailed himself a gold medal with this 10,520 kilos haul from E24. His skill during this tournament has been talked about by an impressed Dutch manager! More may come from this versatile angler in the future. Given the name several years ago, Mr. Barbel is an accurate description of one of the Championship's most accomplished anglers... and he's a really nice guys as well!!! Given the name several years ago, Mr. Barbel is an accurate description of one of the Championship's most accomplished anglers... and he's a really nice guys as well!!! His job is done, and he knows that the gold medal is his as he starts to pack away his equipment. Congratulations Mr.Barbel! His job is done, and he knows that the gold medal is his as he starts to pack away his equipment. Congratulations Mr.Barbel! 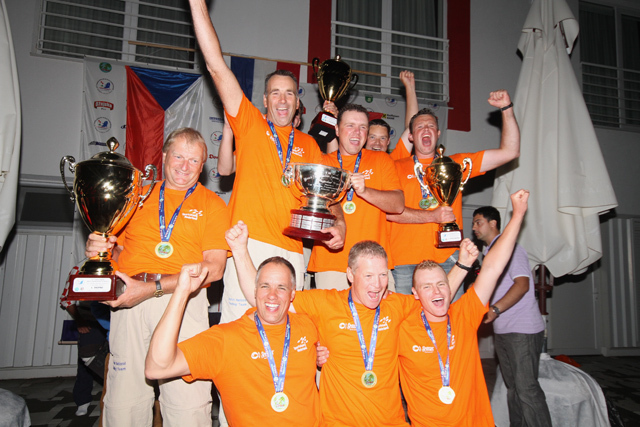 AND OUR FINAL GALLERY OF THE 2014WC, is of the presentation ceremoney, which has little in the way of captions, nearly all the photos speak for themselves! Three top anglers! Three top anglers! It looks like Petr is getting more than a medal here!!! It looks like Petr is getting more than a medal here!!! All the guys look forward to when Barbara dishes out the medals and kisses! All the guys look forward to when Barbara dishes out the medals and kisses! A fitting end to a well organised championship. 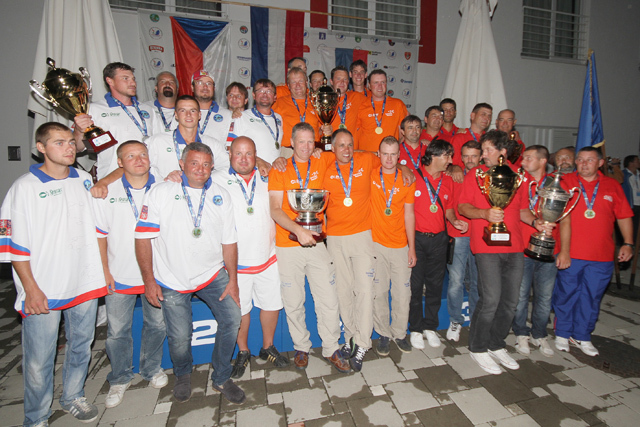 The Croatian officials can be congratulated on a professional and fascinating event. A fitting end to a well organised championship. 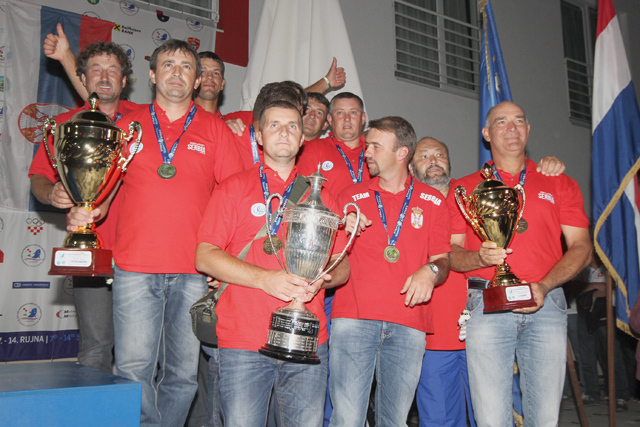 The Croatian officials can be congratulated on a professional and fascinating event. We hope you all have enjoyed our coverage, if not somewhat belatedly!